Our newest installment of the Writers Forum features the memories of writer and racing fan Cynthia Holt and her firsthand account of Nov. 6, 1973, “Secretariat Farewell Day” at Aqueduct Race Course. A plain brown box rests in a corner of my closet. From its modest appearance, one would assume that it holds nothing of importance. Open it, and a cornucopia of memories spills forth in the form of seating stubs, uncashed tote tickets, programs, and all manner of genuine American racetrack giveaways made in China. These are the remnants of the gloriously gripping, sublime days in a racing fan’s life, and each holds a special place in the heart. Among these souvenirs so carefully kept is a keychain. It was once as shiny-bright as a chestnut’s copper coat, and the accompanying chain has been lost, leaving only the medallion as a memento of a red letter day for a big red horse. The medallion is embossed with the figure of Secretariat running full-pelt, his jockey, presumably Ron Turcotte, holding his whip aloft, and the words, “Secretariat, Triple Crown Winner, 1973.” This is my piece of memorabilia from ”Secretariat Day” at Aqueduct Racetrack, when racing’s newest immortal was given a formal farewell before his trip to the breeding shed at Claiborne Farm. Tuesday, November 6, 1973, was mayoral election day in New York City, and a special card was slated at Aqueduct in conjunction with Secretariat’s retirement ceremony, with the Long Island Handicap going as the feature. This was the same track where he had made his debut on July 4, 1972, a fitting date for a horse who was to become America’s hero. He had been defeated that day, enduring a troubled trip, but showed an early spark of his competitive fire by blazing a path from 10th to fourth place by the time he hit the wire. Secretariat scored his first victory there, only 11 days later, and won an allowance race 16 days following that. He also notched impressive wins at Aqueduct in the Bay Shore and in the Gotham in route to the Kentucky Derby, and had shocked the racing world with a disappointing defeat in the Wood Memorial. So, it was fitting that his career would end where his rise to greatness had begun. It was a blustery, bitterly cold day, with the sun playing hide-and-seek behind the wind-whipped clouds. Hats, mufflers, and gloves were the fashion accessories of the moment. It was not a state holiday for most people, and more than a few of the 32,990 attendees no doubt had to contrive some reason as to why they needed the day off. I cannot recall my excuse, but it was a wise boss who drew her own conclusions. As the grafittied train rickety-racked through working class neighborhoods which looked like the backdrop for Archie Bunker’s environs, my thoughts drifted to the train ride to Belmont five months before. The mood then had been ebullient, and the temperature torrid. Today, both the mood and the weather were quite the opposite. There would be no more train rides to see America’s shining horse. This was the last stop. Secretariat was scheduled to parade “under silks” following the third race. In the interim, sales of coffee and cocoa were brisk. All of Secretariat’s races were played continuously on the track’s televisions, and drew enthusiastic responses from the fans. When the footage of the Belmont was shown, many stopped to watch, transfixed, as if they hadn’t already seen the race countless numbers of times. The memory of that transcendent performance alone was enough to bring people to the track that day, frigid conditions notwithstanding. How else do you thank a horse who had left an indelible mark on your heart, and carried you to places you had never been? The racing gods are geniuses of irony, and in that regard, they had set a bountiful table for Secretariat in deference to the day. Two horses were listed in the program who shared one thing in common. They had both defeated Secretariat. Master Achiever, whose claim to fame would be that he had finished ahead of Secretariat in his debut, and second to him in his maiden, was entered in the sixth race. More notably, in the seventh race, Angle Light, who had temporarily derailed Secretariat’s Kentucky Derby express by winning the Wood, was hoping to recapture a glimmer of glory on Secretariat’s banner day, and would be ridden by Ron Turcotte. But it was not to be. Angle Light never won again, but would go down in turf history as the only horse to ever beat both Secretariat and Sham in the same race. The featured Long Island Handicap was taken by Tuerta, a dark daughter of Forli and a Claiborne homebred, who had been born with only one eye. The race would be just a footnote on a career which would be illuminated by a shooting star. Seven years later, she would mate with Seattle Slew, and would foal an almost black colt called Swale who would win the 1984 Kentucky Derby. The first three races passed in a blur. As the time drew near for Secretariat’s appearance, the half-frozen faithful began to stir. Numb fingers fumbled for cameras, and home-made posters with heart-felt sentiments were held high. Exercise rider Charlie Davis, astride Secretariat’s pony companion, Billy Silver, was the first to emerge from the passageway beneath the grandstand. With a huge eruption of cheers and applause, Secretariat followed, resplendent in a royal blue cooler with white trim. Missing were his signature blue-and-white checkered blinkers, which must have seemed strange to him. Groom Eddie Sweat, who had brushed his charge to gleaming perfection and knotted his mane fancifully, walked alongside, speaking softly. 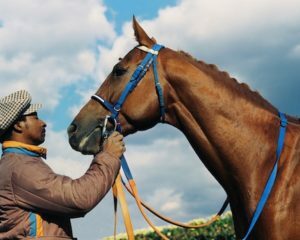 The brisk weather and spontaneous out-pouring of emotion proved a potent elixir for Secretariat, who went into pre-race mode. It had been only nine days since his final start in the Canadian International, under demanding conditions of driving sleet and tricky ground, yet his generous heart was eager and ready to do what he did best. Unbeknownst to him, those days were already behind him. This was the last time that Secretariat would plant his hooves on racetrack dirt. He thought he had come to compete. We would have given the sun and the stars if only it had been true. His cooler was removed, and Ron Turcotte, in the colors which had become iconic and synonymous with Secretariat, was given a leg up. The bugler stepped forward, and blew the call to the post for the last time. From the booth, the announcement that “THE HORSE IS ON THE TRACK” sliced through the air and was swallowed by the wind. Secretariat was wearing the saddlecloth which had been made especially for him for the Arlington Invitational. Back in the 70s, it was extremely rare for a horse to carry its name on the saddlecloth, but Arlington Park chose to embellish his name along with his entry number (1) on Secretariat’s cloth, to honor their distinguished guest. Merely three opponents showed up to face him that day, so track management added another rarity, by allowing win wagering only and condensing the field into two entries: Secretariat, and the other three horses. Secretariat won the Invitational by nine lengths, barely missing Damascus’ course record by a scant 1/5 of a second. Following the race, Ron Turcotte had taken the saddlecloth to safeguard it, until its emergence for this historical occasion. To the tune of “Auld Lang Syne,” which tugged at already tightly pulled heart strings, Turcotte began to jog Secretariat towards the quarter pole. It was impossible to look away from him, even if you tried. Aside from his massive physical talent and immense beauty, he had that mystical quality which defies description. Charisma, magic, the “it” factor, whatever one chooses to call it, it is a gift from the gods, and Secretariat had it in spades. Mid-way through his trek, Secretariat suddenly broke into a canter worthy of a show horse, which drew an additional round of applause. He knew when he was on center stage! The clouds had eclipsed the sun, making it seem colder than ever, but no one was leaving. Turcotte and Secretariat paused briefly when they reached the quarter pole and faced the crowd, as if taking a final curtain call. Secretariat turned and cantered back to the paddock, to rousing cheers and claps, where the presentations were about to begin. The cooler was again draped over what was now a perplexed Secretariat. This was not his usual race day routine, and he didn’t seem to think much of it. A group photo was taken for posterity, which included the star of the show, who appeared so irked at being ushered into the Winner’s Circle without the thrill of a race, he decided to make a meal of some red roses. Penny was standing next to him, and her flowers were tilted in his direction, a temptation which Secretariat could not resist. He began to nibble the blooms so unobtrusively, that at first, no one noticed, being caught-up in the distraction from the press, and in their own emotions. Secretariat was on his second helping when one of the team caught him, alerting Penny and putting an end to his snack. As he was lead out of the Winners’ Circle, there was a final battle of wills, as Secretariat tried to pull Eddie towards the racetrack, where every piece of his genetic make-up urged him to be, while Eddie steered him in the opposite direction towards a future without him. It was over. This was the moment we had dreaded, but it was also the moment of why we had come. As Eddie and Secretariat began the long walk to the barn area, an almost reverential quiet descended on the crowd. People stood and simply watched, each harboring their own thoughts and memories. I was sure that the tears rolling down my face would freeze in place, as I silently thanked Secretariat for the immeasurable joy of watching him moving “like a tremendous machine” that hazy late afternoon in June, for having the privilege of seeing such a magnificent creature fulfill his destiny in the moment for which he had been created. In a time beset by internal strife and disillusion, I thanked him for having provided a safe place for people to put their dreams, within the confines of his enormous heart. Written by legendary turf writer Charles Hatton for Secretariat, in the 1974 American Racing Manual. A Bostonian by birth, Cynthia Holt was raised primarily in Los Angeles, and inherited a life-long love of horse-racing through the enthusiasm of her late father. She attended Immaculate Heart College in the late 1960s and graduated with a B.A. in Theatre Arts which lead to New York and several years’ active involvement on the stage. She has been employed by Santa Anita Racetrack for the past 13 years in various capacities.